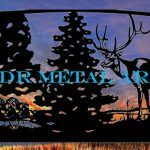 Missouri Driveway Gates | Artistic Oak Tree & Horse Metal Art - Custom Driveway Gates - Iron Steel & Aluminum - JDR Metal Art - FREE Standard Shipping! 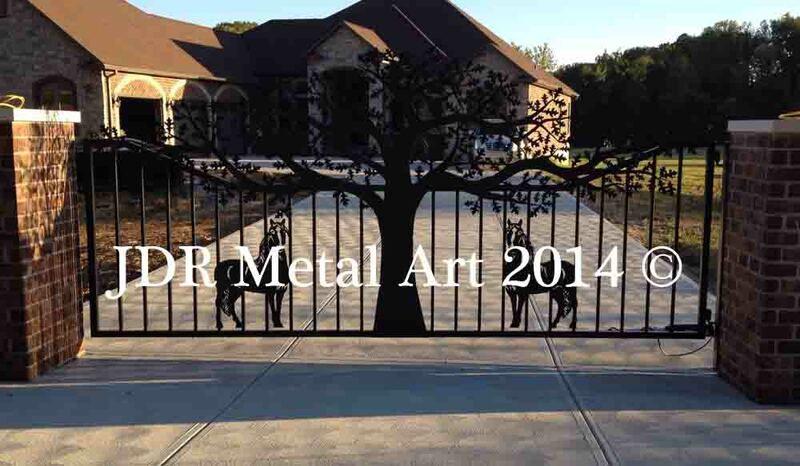 We completed this JDR Metal Art Missouri driveway gate in the summer of 2014. It is a plasma cut driveway gate we custom designed, built and delivered from our gate shop in Columbus, Ohio to Missouri. It is 15′ long and approximately 8′ tall in the center. Our clients graciously sent us the picture after we installed the gate and their brick columns and concrete driveway were later completed, complementing their new 16′ single swing oak tree gate. This was the longest single piece gate we had built up to that time (until the next Missouri driveway gate we designed and built). Usually we end up splitting the gate into two pieces. This was a setup where fabricating a large single swing gate did not present an issue. We used all 1/8″ thick steel wall tubing for the framework. The oak tree silhouette itself was plasma cut by hand out of a 3/16″ thick sheet of steel. 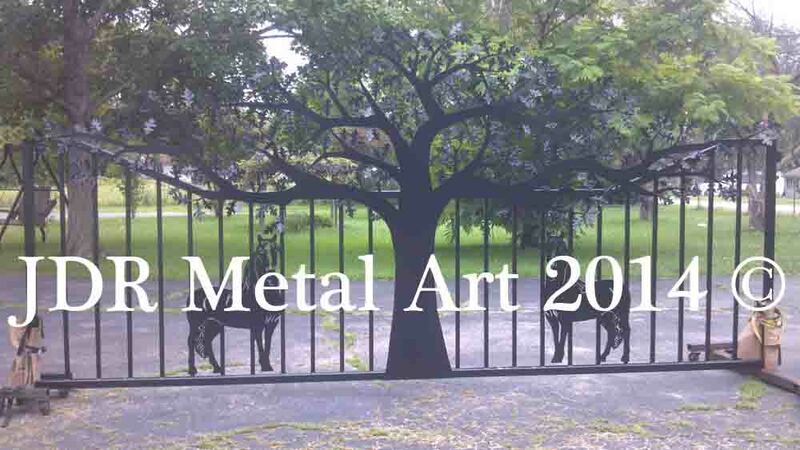 The two metal art horses which accent the tree are also plasma cut from 3/16″ sheet metal. After we put the oak tree leaves on the gate we then sandblasted everything, pretreated it and baked on two coats of “Super Durable” exterior grade black powder coat. For these particular clients we also built a custom metal art headboard to match a Cali-King size bed frame. 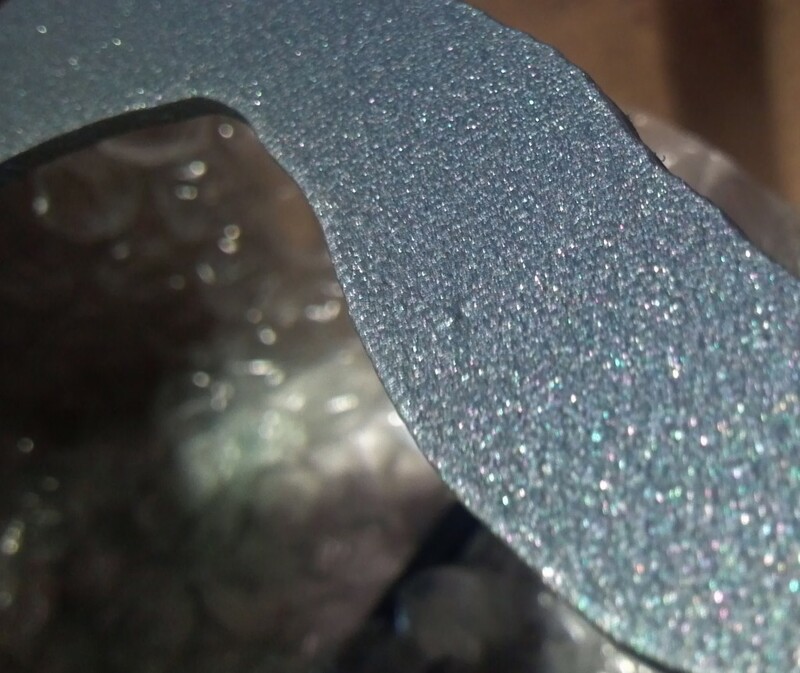 It was powder coated with a special order grey metallic flake finish. 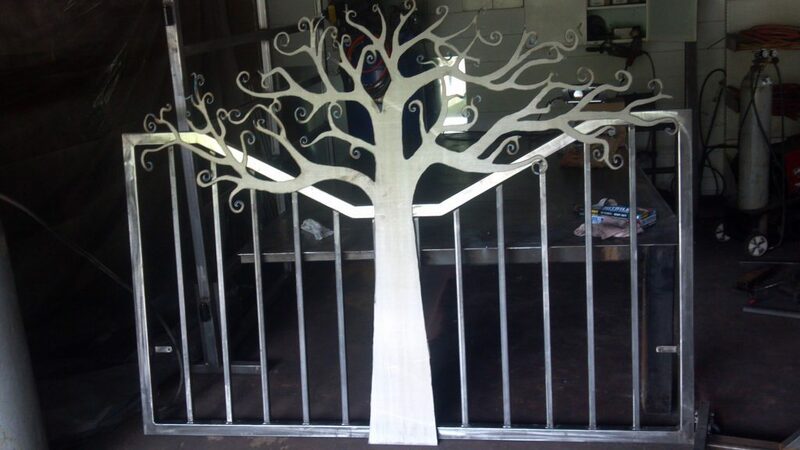 Be sure to check out some of our other custom tree themed driveway entry gates. We build many other designs also. You can have us custom design a project specific to your needs. Feel free to contact us with any questions, we would love to help. 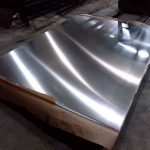 Thanks for reading another post on our JDR Metal Art Blog!